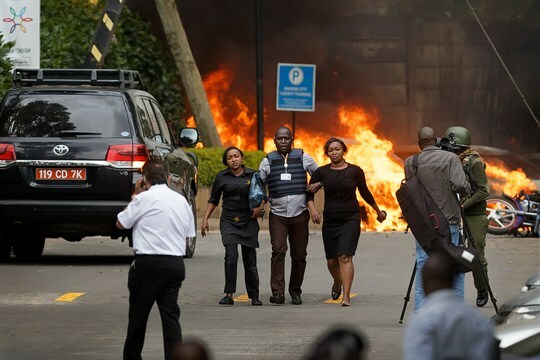 Security forces help civilians flee the scene of the attack at the 14 Riverside hotel-office complex in Nairobi, Kenya, Jan. 15, 2019 (AP photo by Ben Curtis). NAIROBI, Kenya—Last week, a five-man cell from al-Shabab, al-Qaida’s Somalia-based affiliate, entered the popular 14 Riverside hotel-office complex in an affluent neighborhood of Kenya’s capital, where there were more than 700 workers and hotel guests. One of the men blew himself up with a suicide vest, while the four others threw hand grenades and fired on people having a late lunch and then trying to flee.